Protesters demonstrate against President-elect Donald Trump outside Independence Hall in Philadelphia on Sunday. On Nov. 8, Donald Trump surpassed the necessary electoral votes to become the nation's president-elect. But if you look at the popular vote, which is the direct number of votes cast, Hillary Clinton beat Trump by about 1 million votes. He's the fifth person to win the presidency this way. The most recent was George W. Bush in 2000. The other three times all happened in the 1800s. It's been an extremely divisive election, and a lot of people this year are having trouble accepting the outcome. Some — like California Sen. Barbara Boxer — have argued in the wake of the results that it's time to get rid of the current system altogether. The Democrat introduced legislation Tuesday that would abolish the Electoral College and use the popular vote instead to determine the presidency. She has public opinion behind her. According to a 2013 Gallup poll, 63 percent of Americans would get rid of the electoral college. "This is the only office in the land where you can get more votes and still lose the presidency," Boxer said in a statement. "The Electoral College is an outdated, undemocratic system that does not reflect our modern society, and it needs to change immediately." But this is not exactly a realistic proposal. Abolishing the Electoral College would require an amendment to the U.S. Constitution — which would need a two-thirds majority vote in both the House and the Senate, and then it would have to be ratified by 38 states. More than likely, Boxer is proposing this legislation to raise awareness. Democrats have won six of the past seven popular votes, but have lost the Electoral College twice in that time. 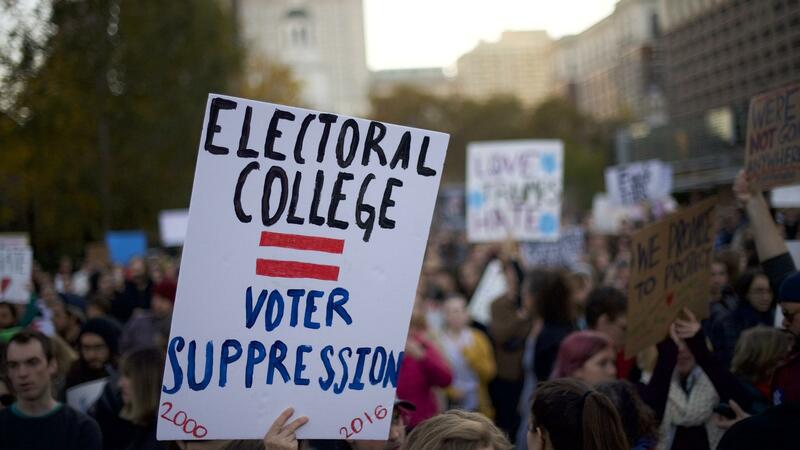 In addition to the proposed legislation, there are several petitions floating around the Internet calling for an end to the Electoral College. One from MoveOn.org has nearly 550,000 signatures. Another petition from the liberal blog DailyKos.com has nearly 780,000 signatures. That one doesn't advocate for a constitutional amendment. Instead, it advocates for The National Popular Vote Interstate Compact, which is an agreement that would have states award their electoral votes to the winner of the popular vote. The idea is that once enough states buy in, the electoral votes that are actually coming from the popular vote would exceed 270 and circumvent the electoral college without ever changing the Constitution. So far, according to FiveThirtyEight, 10 states plus D.C. have signed on to this agreement, for a total of 165 electoral votes. But all of the participating states are solidly Democratic — so they're not actually making much progress. As NPR's Ron Elving explained, the Electoral College works this way: The candidates on each state ballot must indicate presidential electors who will vote for them if they win the state's popular vote. Those electors are the people who actually vote for the president directly, and they meet about a month after the election to do so. The number of electoral votes each state gets is determined by its number of House seats and Senate seats. Most states have a winner-take-all system for their electoral votes. This system, where the state's popular vote winner gets all the electoral votes, dates back to the early 1800s. The Electoral College in general stems from the idea that the people should not be trusted to vote directly for their president, as Elving reported. Critics say it encourages candidates to devote their time only to a few swing states and allows for the possibility of a tie. It also allows for what happened this year — a candidate winning the vote of the people, but still losing the presidency. This year, the electors won't vote until Dec. 19, and they aren't legally bound to the candidate for whom they said they'll vote. Some opponents of the system are trying to capitalize on that aspect of the Electoral College, rather than trying to get rid of it entirely. A Change.org petition with nearly 4.5 million votes is "calling on the Electors to ignore their states' votes and cast their ballots for Secretary Clinton." In that scenario, they would become what is known as faithless electors. It seems unlikely, though, that electors pledged to Trump would switch to Clinton rather than to another Republican. Trump himself has criticized the system of which he is now a beneficiary. In a 2012 tweet, he called the system a "disaster for a democracy." But on Tuesday, the president-elect changed his tune, tweeting that the system that got him elected is "actually genius." He also tweeted that if the presidency could have been determined by the popular vote, he would have adjusted his campaign strategy and "won even bigger and more easily." He specifically said he would have campaigned more in New York and California, but Clinton won the popular vote in both of those states by wide margins.